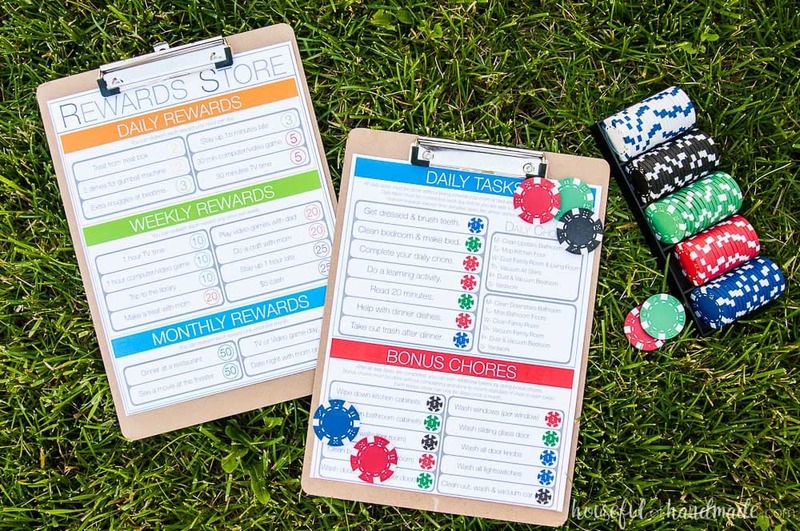 You are here: Home / Decorating / Printables / Printable Kids Chore System that Works! Create a kids chore system that works! This easy to manage chore chart for kids helps them to learn responsibility and savings. 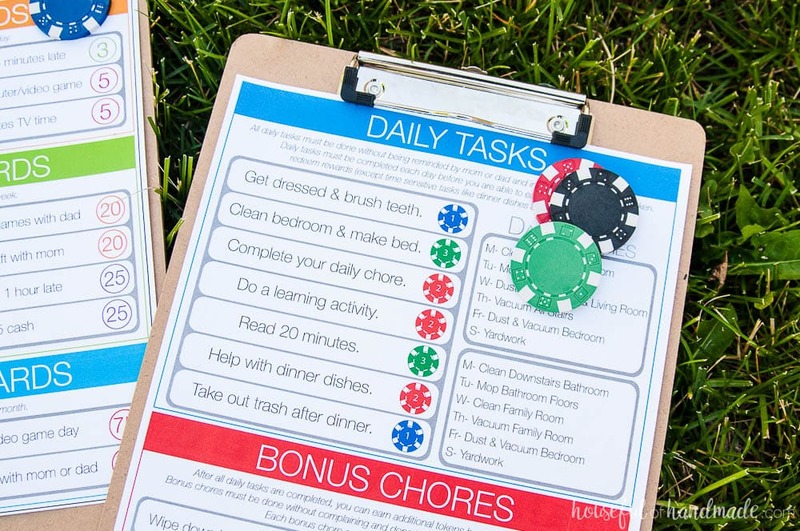 Includes a free printable kids chore chart so you can make your own chore system. Finding a kids chore system that works is not easy. 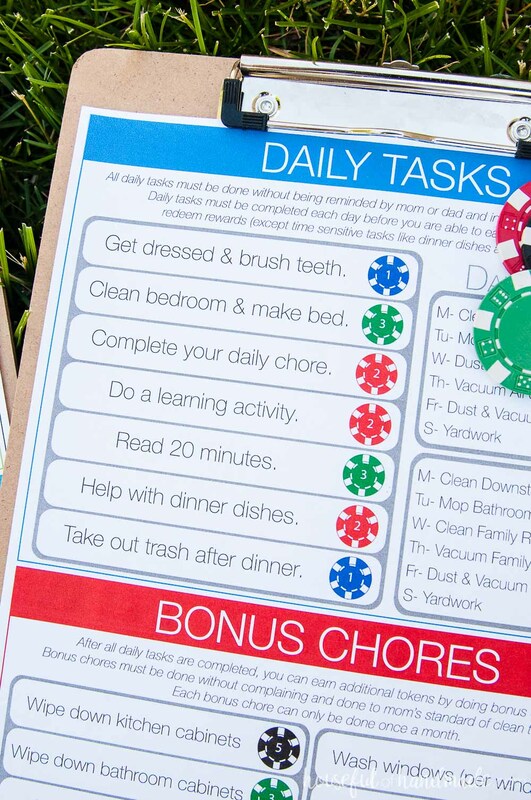 We have finally found the perfect chore chart and reward system that helps our kids succeed. This chore system not only helps our kids understand the importance of doing their part around the house, but it also teaches our kids the value of their work, how to save for things they want, and delayed gratitude. It really checks off so many boxes, and isn’t too complicated for us to manage. 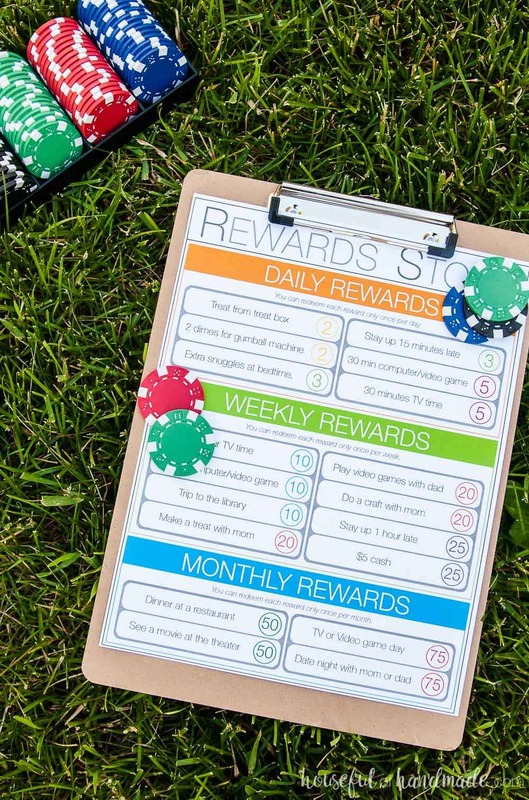 Best part is, I am sharing all the details of our new summer chore system with a free printable chore chart and reward chart. When trying to come up with the perfect kids chore system, there are so many option out there. You can do wheels and stickers, rewards and bribes. We used our simple Free Printable Daily Chore Charts and Free Printable Summer Chore Charts for the past couple years. However, now our kids are getting older and we want their chore charts to be a bit more than just a list of things we want them to do. If the kids do or do not complete their chores or daily tasks, they need to have consequences. The same way it is in real life. And if they choose not to do their work for many days in a row, then what? Every day is a new day with a simple chart. Not anymore. Now the kids are paid in tokens for doing the things that are expected of them. These tokens become their currency for things they can buy (no tokens = no TV or computer). If they choose to not do what is expected of them for multiple days, they have no money for things they want. But if the kids really want something, they can do extra chores. Hurray for mommy (because otherwise I would never get my baseboards washed). Then they can earn more tokens to work towards the big rewards faster. 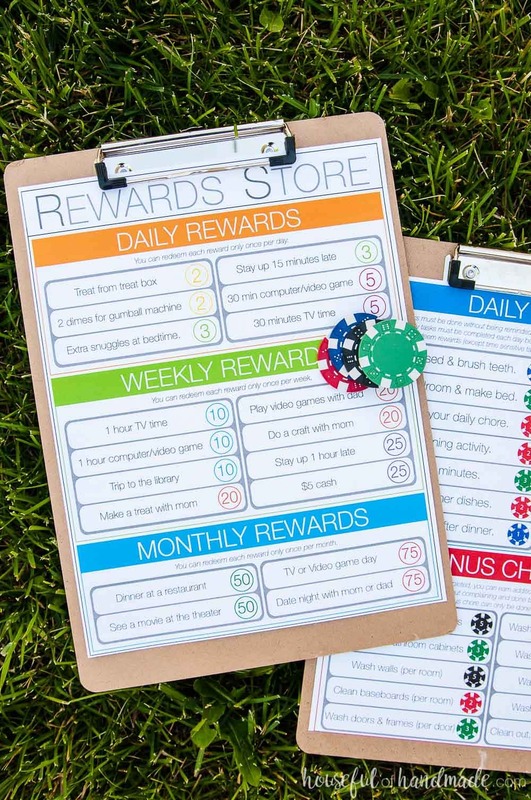 What makes this kids chore system work is the Rewards Store. And don’t worry, it doesn’t have to be fancy. One of our kids favorite rewards is “Extra Snuggles at Bedtime”. Those extra 10 minutes to cuddle and read a story make them feel so special. But before they can cash in on any rewards, they have to have completed their list of daily tasks (except time sensitive stuff like dinner dishes & take out the trash). Does this mean our kids always clean their bedrooms. Nope! But they do not ask for TV or computer time because they know they have not completed their daily tasks. Some weeks, the kids do not clean their rooms at all. They just hang out there playing or reading. But most weeks they are eager to get things done so they can cash in on their rewards. The Rewards Store has 3 different types of rewards. One set of rewards they can cash in once every day if they have the tokens for it. 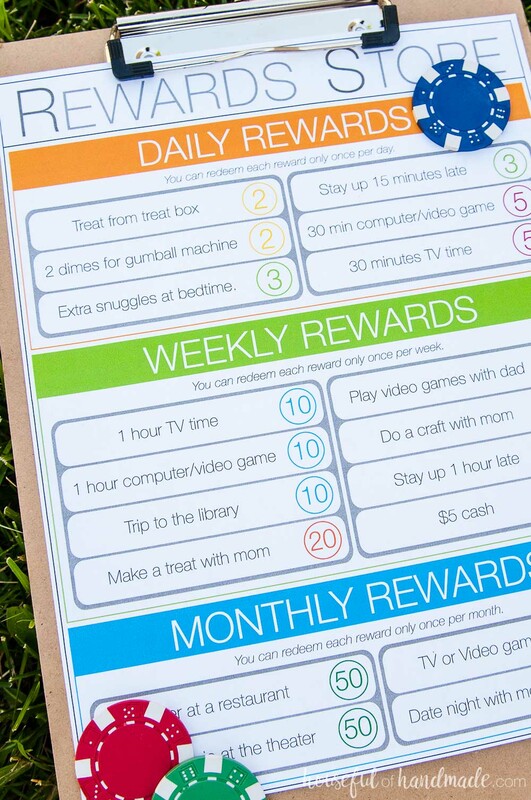 These are super simple rewards like 30 minutes of TV or video games, a treat, or extra snuggles at bedtime. And for summer I added the much anticipated “Stay up late” reward! There are also larger rewards that can be cashed in once a week or once a month. The weekly rewards are bigger, but still very attainable. Then there are the monthly rewards that require them to save their tokens for multiple days, even weeks, to earn. This is where the kids chore system is pure gold. It teaches the kids to work hard and save for long term goals. If they want to cash in on those bigger rewards they have to avoid cashing in tokens on all the daily and weekly rewards, or they need to do extra work to earn them. Just like in the real world! For our tokens, we use inexpensive poker chips (<–affiliate link). They do not have number amounts printed on them so we just made up what would work for us. Then we made fun token banks for the kids to store their earned tokens in. They are responsible for not loosing their tokens (or playing with them). If tokens are found left around the house, they go back to the bank and the kids loose them. Again, just like money in the real world! We truly love our new kids chore system. It is easy enough for mom & dad to manage, but really helps us to teach the kids the things they will need to become adults. We also let this be a flexible chore system for our family. When we have company coming over, it becomes double points day for any extra chores. Or if someone brings home an exceptional report card, we can reward them with extra tokens that they can use for the rewards they want. And when we are busy doing a crazy DIY (like the kitchen remodel), we can make all rewards double for the day so they get twice the TV time for the same price. 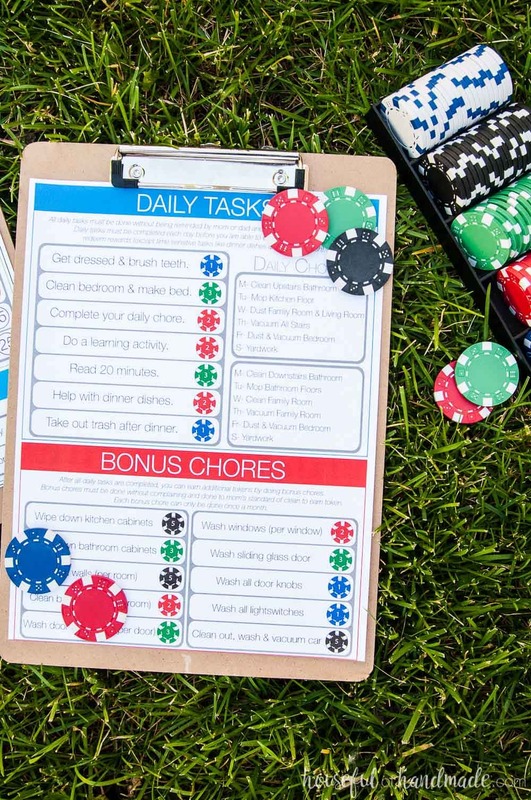 Since we love our new kids chore system that works so much, we want to share it with you. 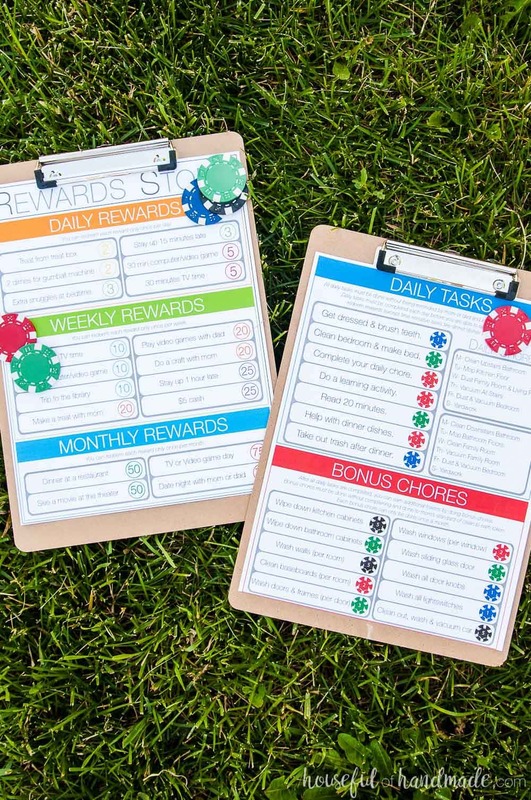 If you want to get going ASAP, you can download the PDF of our chore and reward system. But if you want to create your own, I also included a blank JPEG of our chore system with PNG files of all the tokens and reward amounts. You can easily customize one for your family. I am sharing all the printables for the kids chore system in the subscriber library. Click here to subscribe to my weekly newsletter and gain access to all the freebies. If you already have your password, click here to download them. And now hopefully we can all be a little more productive this summer! I have not received my email and am interested in the kids chore system….Help! Have you checked your promotions or spam folder? Check there and then let me know if you still didn’t get it and I can investigate. Is there an editable version of the PDF? I’d like to customize the chores, but don’t want to fill it in handwritten.. There is not, but I am working on adding a customized option to the store so you can give me the chores and I will format them in for you. Stay tuned!